PHUKET: -- Four Indonesian men were arrested in Haad Yai, southern Thailand, yesterday while heading for the Malaysian border after stealing 2 million baht from a Phuket policeman. Sen Sgt Maj Boonyung Punsawat, an investigator with the Phuket Provincial Police, cashed a cheque for 2 million baht at Siam Commercial Bank in Rassada yesterday morning, explained Maj Gen Chonasit. 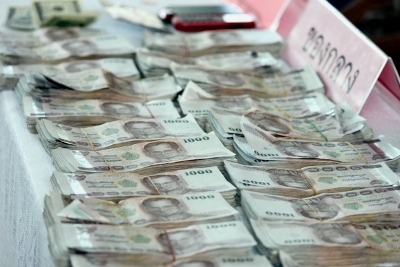 Maj Gen Chonasit did not explain what the 2mn baht in cash was for, or how Sgt Boonyung had come into possession of it. Amid and Husin allegedly watched Sgt Boonyung cash the cheque, and alerted Anwar and Pratama to follow him on their rented motorbike. At about 11am, Sgt Boonyung pulled over to the side of the road in Samkong to buy a coffee and left the engine of his pickup truck running. Seeing the opportunity to strike, Anwar and Pratama pulled alongside. Anwar, riding pillion, got off the motorbike, opened the truck door, grabbed the 2mn baht, got back on the bike and they sped off. Sgt Boonyung reportedly called “the police” right away. Officers soon identified the motorbike the pair were riding from CCTV footage and quickly found the shop on Phang Nga Road in Phuket Town where Pratama had rented it. By the time officers arrived at the shop, the bike had already been returned. Police matched Pratama’s face from the copy of his passport at the shop with the man operating the motorbike in the CCTV footage. Fearing the men had already left the island, police alerted Highway Police officers in Phang Nga and Songkhla about the incident. Good news arrived at about 7:30pm for Sgt Boonyung, when Haad Yai Highway Police officers informed Phuket Police that they had caught all four men on a bus heading from Phuket to Haad Yai. The Haad Yai officers found 1.14mn baht in four black bags belonging to the men and a further 860,000 baht wrapped in a bundle of clothes under one of the men’s seats. After questioning by police, the men apparently confessed that they stole the money from the policeman’s pickup. The four suspects were brought back to Phuket to face charges. All four have been charged with committing theft with the use of a motorbike. Maj Gen Chonasit said that the men were aiming to cross the border into Malaysia at Sadao, in Songkhla province. 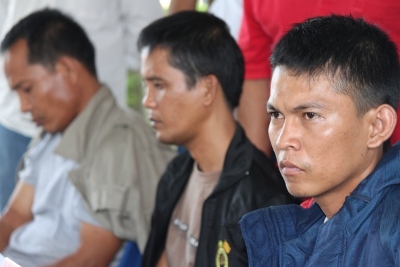 “They have refused to admit that they have committed other robberies,” Maj Gen Chonasit said. “Police had to work quickly to prevent them from escaping Thailand,” he added. Commander Chonasit urged all people in Phuket to be wary of such thieves. “Phuket is a tourist destination and all kinds of people live here. People who carry valuables and lots of money with them should be very careful, as anyone could be watching them and steal their property,” he said. No holes in this story. Perhaps they forgot to leave the XXXXX in exchange for the cash. According to another source from the sale of land. Repeat after me children, I must not leave ฿2 000 000 in an unlocked car, nor must I leave the engine running. Must be one of Thailand's finest. WOW had it been a farangs 2 million it would have never been found and what is a policeman doing with 2 million baht that is more than he would earn in 18 years as a policeman !!!!!! hey but like the advert says " Welcome to a miracle year in amazing Thailand " for sure I will never cease to be amazed with what happens in the land of smiles !!!!! Yes, I also find that behaviour very, very strange. I don't know, how much do policemen make in Thailand? Can you list any regional difference? And diffference by rank or year of service? You just can't make this &lt;deleted&gt; up... A cop cashes 2mil. In PHUKET. , this must be a wind up. Who gave the cop the check and what was it for. The only good part of this story was that there was no violence and nobody was physically hurt. First of April - or what ?? Amazing! They were able to review CCTV footage quick enough to apprehend the suspects before they could flee over the border, but the same quick investigation work could not be done in the case of the two dead Canadian girls on Phi Phi! CCTV footage was reviewed too late to find the last known person to have seen the girls alive. Is it unfair of me to presume that had the same guy just nicked 2M baht of a Thai Policeman they would have had him custody a week ago already.